Customer Respect "Due to a Higher Than Usual Call Volume..."
Frequently this follows an interminable IVR (Interactive Voice Response) message like, “If this, then press 1, if that, press 2…” and so on. I am no expert, but I have counted over 70 such software product suppliers in the business, with appealing names like Plum Voice, Fluent Stream, Bigmouth. I don’t suppose there’s much to choose between them, on the basis of my own experience, as a customer-user of the products they sell. To many businesses dealing with consumers seem to persist in the illusion that their operations are improved by imprisoning customers calling for help in IVR prisons. Customer service expectations are rising very quickly, demanding faster and more personal contact beyond the limits of most digital services. To ignore personal needs for community is a big mistake. Each contact that a customer makes with a producer has a value not to be thrust down a pipeline to a void. Startups that aim to build strong customer relationships will progressively need to build means of communication and support that reveal that desire to be true, rather than a marketing sweet talk. A single interaction with a customer can be a make or break opportunity. Customer respect does not just happen. IVR systems have enormous potential for turning a happy customer into one who will badmouth and desert you as soon as an alternative is available. Invest in people to provide direct customer support, allowing staff to behave as people, not as script readers, or adherents to strict company rules; give them authority to be problem-solvers, as if they were in charge. Ensure that messages are user-centric, not supplier-centric, for example, do not leave a message including words like, “…as our menu options have recently changed…” on the system for longer than say a week, because regular callers will know it to be b……t. Make it a conversation, not a phone tree. Tell callers immediately how they can speak with a person, rather than leaving it up to them guessing than they can press zero or nine. Offer callbacks with timeframes and be informative. If Amazon can do that, so can you. Do not hide contact numbers and processes, as Amazon does. When contacting customers by mail, always date the letter, give appropriate reference numbers and give several options for contact, including a company department, address, phone, email and make it as personal as possible, including staff members’ names. Prior to any sale, ensure that you have put yourself in a buyer’s situation, both at the point of sale and later in a use/query/complaint situation. Avoid jargon, small print or other impediments to successful communication*. 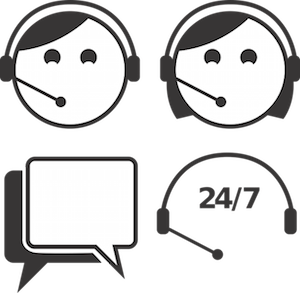 Regularly check in person with customers about their satisfaction with customer support and avoid meaningless surveys. Be proactive, by setting up user panels, or for big ticket sales, organize user conferences; brainstorm creative ways to reinforce customer satisfaction, making sure you sure you use outbound methods as well as inbound ones. Offer alternative channels of customer contact. For example, not everyone likes using the telephone, whereas others hate email. Do not use corporate speak, such as, “…can’t be done as it’s against company policy”, or “… no because I don’t have the authority to…”, or “we only provide refunds if…” or worse still, “I can’t do that. It’s above my pay grade”. When a member of staff answers a call, they should always give their name clearly, ask for a call back number, ask the customer’s name and repeat it (and, if the call is dropped for any reason, make sure the call is reconnected). These are all mind-bogglingly simple recommendations on customer respect, and all reflect respect for people who spend money to buy your product or service. The feel of the manufacturer or service provider is very important to the individual who makes a purchase, however small. Above all, remember that feedback is gold, not an irritant. Those 12 ways of showing customer respect are just the start. Real customer respect will only result from personal attitudes at the top of the organization and at all levels, including among the customer facing people. It starts with the founder and her attitudes to people. To help understand what I mean, have a look at this post on founder compassion. On a wider canvas you may want to read the one on Connection, Trust, and Love, which discusses the difference between espoused values and deep emotion. How often have you heard how a company claims to put its customers first and your experience is that they treat you like s..t? The mention of ‘touchy, feely’ words tends to put the hardened executive off. The reality is that we all have emotions and can connect not only at the practical, but also at the emotional level. The successful entrepreneur will recognize this and build a company that is able to share such values both inside and outside the business. * When I started my first business, we printed terms & conditions of sale in light gray ink in eight point type on the back of invoices, but early customer feedback led us quickly to change to twelve point type in black ink and used much simpler language. When we did so, we got loads of positive feedback!